YWAM Publishing is no stranger to the homeschooling community. For years they have produced quality biographies about Christians both past and present. Last year we had the pleasure of reviewing their C.S. Lewis book and it was wonderful! We recently received Heroes of History- Douglas MacArthur ($7.50) for review, and just like that last one, it has been a delightfully fun read. Along with the book we also received the Digital Unit Study ($7.49) that accompanies it. Written by Janet and Geoff Benge, this biography is the adventurous story of Douglas MacArthur from childhood to his death on April 5th, 1964. Growing up in a military family Douglas wanted nothing more than to be just like his father and grandfather. He wanted to grow up and serve his country in the military. Being raised on military base after military base, young Douglas had many adventures around the different bases and also learned some hard lessons at very early ages. As a young man, Douglas was faced with difficulties in reaching his goals. Unforeseen physical issues and the death of his hero (his father) made his high school and college career harder to get through. Once he finally got into the training facility of his choice, West Point Military Academy, Douglas began the path of his father and grandfather before him. 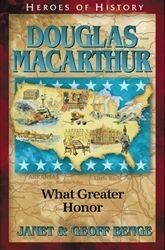 Through many adventures and hardships- both military and civilian- Douglas matured in his faith and his determination to confidently become the leader worthy of the name MacArthur. The biography is such an enjoyable quick read. I read it personally, although when my preschoolers are a bit older, it will be a fantastic read aloud. I suspect all the Heroes of History books would be. Like I mentioned above, we also received the unit study guide that goes with the title. The study guide includes wonderful ways to incorporate geography, literature, science, essay writing, creative writing, public speaking, drama, art, and even some life skills into your learning experience. Of course you don’t have to make each Heroes of History book an entire unit study but, wow, there are a lot of great ideas in there! One of my favorite things about the “extras” that come with the study guide is the Heroes of History Biography Chart. It lists each title, it’s era, social study topics, and character qualities to be learned from the book. Just using the chart, you can plan your history years in advance! Or, if your child is struggling with his/her character, you can glance through the chart to get some good ideas on who to study in school so they can have a good role model (hero) to help develop those desired traits. As always, we’ve really enjoyed read the book and using the study guide to enhance the learning experience! We look forward to more resources from YWAM Publishing!